We started with 155 products all marketed as natural deodorants. Our picks included recommendations from “best of” lists in magazines like Allure, Good Housekeeping, and Men’s Journal, as well as best-sellers from mainstream retailers (think Walgreens) and natural- and organic-oriented e-commerce sites, like Thrive Market and Swanson Health Products. 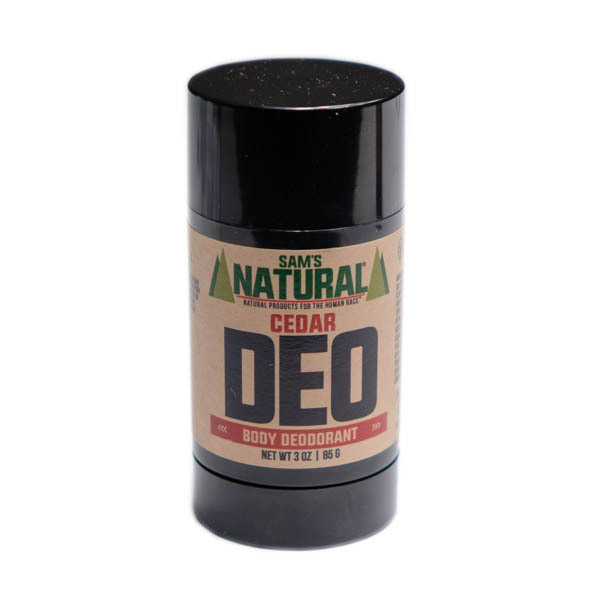 The best natural deodorant fends off odor without using ingredients that are likely to be toxic or irritating. After talking with a dermatologist, a chemist, and two natural deodorant creators, we hand-tested 23 to find our top picks: aluminum-free formulas with pleasant scents, goop-free application, and minimal residue. Two brands of long-lasting, aluminum-free sticks that leave little clumping or flaking. Both come in a wide range of scents. Not two, but all three of our wishlist odor-fighting ingredients. Unfortunately, it comes with a stickier application experience. This stick’s ingredients are certified organic by the USDA. A cream that’s messy to put on, but boasts an impressive ingredient list. A high-end hybrid between deodorant and perfume. In the world of deodorant, “natural” is often code for “aluminum-free.” But we wanted more: a product that was also easy to apply and effective at stopping odors. Call us dreamers. Sam’s Natural Deodorant checked every box on our list. The product is free of aluminum, free of common irritants, and its first two ingredients (coconut oil and baking soda) are verified odor-blockers. We found the circular stick easy to maneuver across our pits, and it left minimal goop on clothes and only a faint sheen on skin. The Cedar and Women’s scents that we tested both lasted through two hours of wear — without smelling overpowering — and if neither of these options appeals to you, Sam’s offers 13 more scents. Each stick is reasonably priced ($10 for 3 ounces) and an easy gateway for anyone interested in transitioning to a natural product. We nearly missed Schmidt’s Natural Deodorant altogether since some of its other product lines, including its jar formulas and sensitive skin sticks, only feature one of our targeted ingredients. But Schmidt’s sticks for regular skin boast the same odor-busting coconut oil and baking soda as Sam’s, in a similarly flake- and residue-free formula. We tried four of its seven scents and liked the cool “freshly fallen rain” nose of the Charcoal+Magnesium formula — although if you like a pop of floral, its Rose+Vanilla certainly delivers. The price point is about the same as Sam’s: around $10 for 3 ounces. For Pit’s Sake is an excellent runner-up. This product comes in a stick that leaves almost no residue, but we did have to use quite a bit of force to fully coat our pits, which some of our hairy-pitted testers weren’t too into. That said, it includes all threeof the odor-blocking ingredients we pinpointed in our research — coconut oil, baking soda, and zinc — at a comfortable $9. If buying organic is your top priority, we’d suggest Green Tidings. Like Sam’s and Schmidt’s, this deodorant is vegan and cruelty-free, but its ingredients are also certified organic by the US Department of Agriculture (USDA) and it’s made in a solar-powered plant. The trade-off? It’s a little more expensive, at $8 for a 1-ounce tube. Green Tidings is aluminum-free and includes baking soda and (organic) coconut oil to fend off body odor. The subtle scent (courtesy of organic lavender essential oil) didn’t last as long as Sam’s, but after two hours, we didn’t notice any BO, either. Testers did find the product a bit gritty, but some of them liked this added assurance that they’d successfully coated their underarms. We also unearthed a couple more intriguing options. Fatco Stank Stop Deodorant was the only other natural dedorant we tested that included all three of our wish-list odor-blockers. (It’s also Certified Paleo, and includes beef tallow as a moisturizer.) Fatco is a cream, which means you’ll need to dip your fingers into a (very small) jar to apply the product — a process our testers weren’t wild about. But the deodorant itself was very effective, with a pleasant smell and minimal residue. 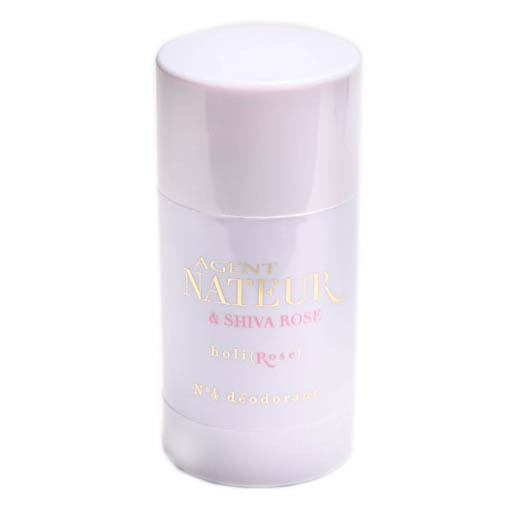 Some of us also really loved Agent Nateur & Shiva Rose Holi (Rose) Deodorant, which seemed almost like a combination of deodorant and women’s perfume (although not everyone liked the rose and sandalwood scent). Holi Rose leaves very little residue, and while it was also the most expensive product that we tested ($25 for 1.7 ounces), it’s a good high-end option if you’re concerned about protecting delicate fabric. Then we had to figure out what “natural” even means. When it comes to beauty and bodycare products, it turns out that neither the Food and Drug Administration (FDA) nor the USDA regulates the term “natural.” And that can be a problem. According to the experts we consulted, many natural deodorants were specifically developed because of concerns about aluminum. Research stretching back more than 50 years has suggested that aluminum exposure might increase your risk of developing Alzheimer’s disease, and separate studies have also linked aluminum exposure to breast cancer. However, the National Cancer Institute, American Cancer Society, andFDA all believe there’s not enough evidence to support either claim. The FDA doesrequire aluminum-based antiperspirants to come with a label advising anyone with severe kidney issues to consult with their doctor before using it (aluminum is eliminated from the body by the kidneys), but even here, the National Kidney Foundation indicates that risk is low. Still, concern over the safety of aluminum-based antiperspirants persists, both from venerated news sources (including Scientific American and Time) and newer, “green”-centric blogs, like mindbodygreen and TreeHugger. For more, read our review on thebest antiperspirant. We cut any deodorant containing aluminum — in any form. Cutting aluminum was an obvious choice, but it also meant we had to avoid potassium alum. This ingredient is a mineral salt often used in products marketed as natural deodorants (including products from both Tom’s of Maine and Crystal). Because potassium alum is mined from the ground, you can argue that it’s “natural.” But it’s still a type of aluminum. Then, we struck out potential irritants. Most of us apply deodorant every day, on an area of skin that’s already thin and delicate — especially if you shave regularly. We wanted to ditch anything that increased the chance of itchy, bumpy pits. FDA LoopholesThe FDA requires any retail cosmetic to list its ingredients, usually individually. The two exceptions: “fragrance” and “flavor.” The Fair Packaging and Labeling Act (FPLA) deemed fragrance and flavor to be complex mixtures of many natural and synthetic chemical ingredients; asking a company to reveal these might force it to tell its trade secrets. Fragrance “can cause mild to severe irritation,” says Dr. Audrey Kunin, dermatologist and creator of the DERMAdoctor skincare line. “As a dermatologist, I formulate products to be fragrance-free for this reason.” Other dermatologists we spoke to told us the same. Cutting anything with synthetic fragrance also increases transparency, as the term can mask any number of unidentified chemicals. Simple alcohols can have bacteria-fighting properties — a good thing because it’s the bacteria that feast on your sweat that cause body odor. But they can also ruin the skin’s protective lipid barrier, causing irritation. On an ingredients label, simple alcohols may appear as isopropyl alcohol, SD alcohol, or denatured alcohol. Propylene glycol and propanediol are both frequently used in body care products as solvents and preservatives, but there’s a growing body of research suggesting they could be toxic. “They are no longer being used regularly due to some data that they might be harmful,” confirms cosmetic chemist Ron Robinson, of BeautyStat.com. Indeed, both are included on Whole Foods’ list of unacceptable ingredients for premium body care. From there, we looked for formulas that included coconut oil, zinc oxide, and/or baking soda. Companies tout a slew of naturally derived ingredients for their ability to mask smells and fight bacteria. But we found the strongest evidence in support of coconut oil, zinc oxide, and baking soda — and these three options were also mentioned again and again by our experts. Coconut oil “contains lauric acid, which is very good at killing odor-causing bacteria,” says Morin. Additional research from the journal Antimicrobial Agents and Chemotherapy confirms lauric acid’s bacteria-killing powers. Zinc oxide has been used in deodorant products since the 19th century. (Fun fact: It was actually the active ingredient in Mum, the first trademarked deodorant.) Today, research from the Society of Cosmetic Chemists (login required) shows that it can neutralize odor by converting smelly, short fatty acids released by bacteria when they feast on your sweat into odorless zinc salts. In fact, the same study found zinc oxide to be three times more effective at this process than aluminum chlorohydrate, a common active ingredient in traditional antiperspirants. Baking soda “is one of the most effective ingredients for eliminating acidic odor-causing bacteria,” says Jaime Schmidt, the founder and chief product officer of Schmidt’s Naturals. Robinson agrees: “It deodorizes due to its ability to neutralize a wide variety of substances.” Baking soda can raise the pH of an environment, which, in the case of a sweaty (and therefore acidic) armpit, makes the area inhospitable to bacteria. To capture the most deodorizing power, we looked for formulas with at least two of these three ingredients. That left us with 19 natural deodorant formulas in a variety of of scents to try out for ourselves. We tested each one for scent, ease of application, and residue. To test our remaining options, we enlisted 14 subjects — men and women, with both shaved and hairy pits. We asked them to evaluate each natural deodorant on three qualities: scent, application, and residue (similar to our testing process for the best antiperspirant). First, our subjects sniffed each product in its container, and then again on their own skin two hours after application. We were looking for a fresh, neutral scent — nothing too noxious or overwhelming. We also wanted to check out the application process. Some of our finalists, like Fatco’s Stank Stop Deodorant, were creams that you dipped into and rubbed in with your fingers; others, like Bubble and Bee Lemon & Clove Pit Putty Organic Deodorant, were technically sticks, but so soft that excess product kept globbing around the rim of the applicator. Regardless of application method, we wanted to weed out products that clumped, crumbled, or refused to glide on. Wearability was important, too. After applying each product to our underarms, we evaluated how it felt after a couple of hours: Sticky? Tacky? Too thick? At that two-hour mark, our testers also swiped a square of black T-shirt fabric against their armpits to evaluate how much of the product wiped off. The less residue, the better. We expect the best natural deodorant to stay on our skin, not our shirts. Sam’s Natural DeodorantProven odor-blocking ingredients, no aluminium, and comes in an easy-to-apply stick. Sam’s comes in 15 scents. We tested both its “Women’s” and Cedar options, but a quick look at ingredient labels confirmed the only difference is the essential oil used for scent. Of the two we tested, Cedar was slightly fainter, and Women’s had an herby lavender smell (although some of our testers described it as “citrusy”). Both scents were fairly unisex, pleasant upon first application, and held up well when we checked in two hours later. A quick note about deodorants marketed as men’s versus women’s. Sam’s also performed well in our application and residue tests. The product comes in a circular stick that was easy to maneuver across our pits. In fact, our testers generally preferred circular sticks (like Sam’s, Primal Pit Paste, and SoapMe) over ovals (like Hippie Stick and For Pit’s Sake). The shape seemed to fit better inside our armpits and left less excess goop on our underarms and around the stick’s rim. Sam’s also left minimal residue on T-shirt fabric — one subject noted “almost nothing, no flaking or clumps” when he checked. The only deodorants to outperform Sam’s in our residue test were For Pit’s Sake and Agent Nateur No. 4 Holi (Rose) Deodorant. However, For Pit’s Sake and Agent Nateur both featured scents that were more polarizing: One tester likened For Pit’s Sake’s Lime & Clove to “the musty scent of someone who had been out working in the woods,” although it does also come in Unscented, Lavender, and Citrus. 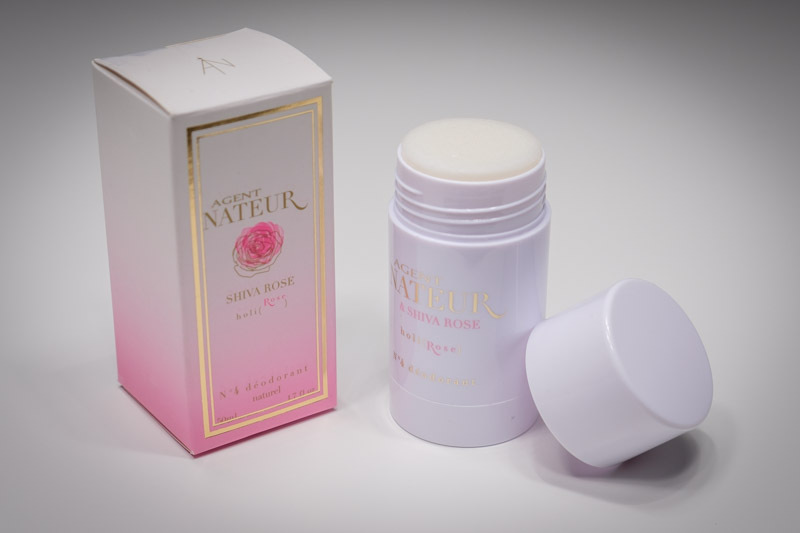 Agent Nateur got a more positive reception, but was dubbed extremely “feminine” thanks to its blend of rose and sandalwood, with one tester saying it was “a little grandma-y.” In short, both our Sam’s deodorants were more universally appealing. At $10 for a 3-ounce stick, Sam’s also falls a little below the median price of our 23 finalists (which ranged from roughly $6 to $25). And if you want something that’s kind to the planet (and not just your wallet), you’ll be happy to know that Sam’s is hand-crafted in New Hampshire and vegan and cruelty-free. 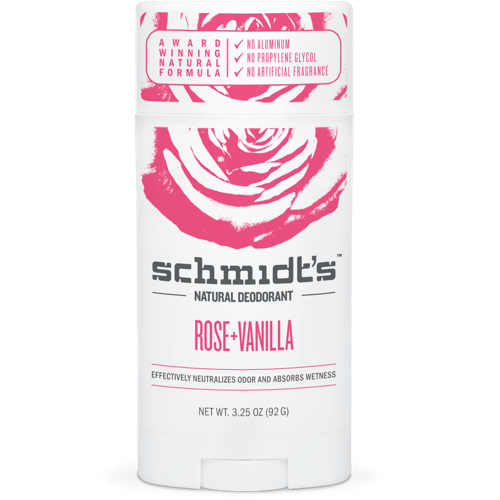 Schmidt’s Natural DeodorantAnother favorite featuring baking soda and coconut oil odor-blockers, minimal residue, and seven scents to choose from. If you like the sound of Sam’s, you’re going to have a tough time ignoring Schmidt’s. The formula in its Natural Deodorant Sticks isn’t quite as creamy as Sam’s — we had to press it into our pits to warm it up for a few moments when putting it on. And it comes in a traditional oval applicator as opposed to our preferred round. But Schmidt’s ingredients list is spot on: baking soda and coconut oil, plus shea butter and arrowroot powder to help it glide. We nearly missed Schmidt’s in this review — its other product lines, including its sensitive skin sticks and its cream formula, only feature one of our three targeted ingredients. But we were glad we did a second sweep and discovered its regular-skin formulas, which matched Sam’s lack of flaking and residue. Sam’s wins with its sheer number of scents — 15 to Schmidt’s seven — but we give credit to Schmidt’s newest addition, Charcoal+Magnesium. It’s “freshly fallen rain” aroma was the ultimate favorite of everything we tested. You can grab a stick of Schmidt’s for about $10. For Pit’s Sake! Natural DeodorantContains all three of our top odor-blockers and left little residue — but application isn’t as easy. 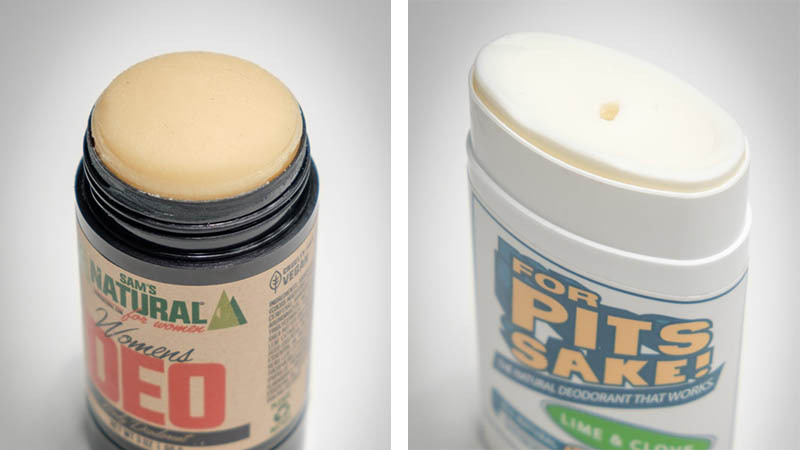 For Pit’s Sake was one of only two natural deodorants we tested that contained baking soda, coconut oil, andzinc oxide, not just two of our wishlist ingredients like most of our other top. This combination is definitely a winning formula: Testers were unable to detect any body odor at the two-hour mark, and For Pit’s Sake did an outstanding job on our residue test (tying with Agent Nateur, an option we touch on below). “Did I even put it on? I know I did because I can smell it, but wow there’s no residue at all,” noted one of our testers. But some of us found it a little too dry, with one of our hairy-pitted testers complaining that it “wasn’t very giving” and that he had to do “repeated passes” to achieve full coverage. The stick also had a flat top, with edges that added to our discomfort. Almost unanimously, we did not like the lime and clove scent that we tried (it was sort of like a combination of “margarita” and “grandmother’s holiday punch”). 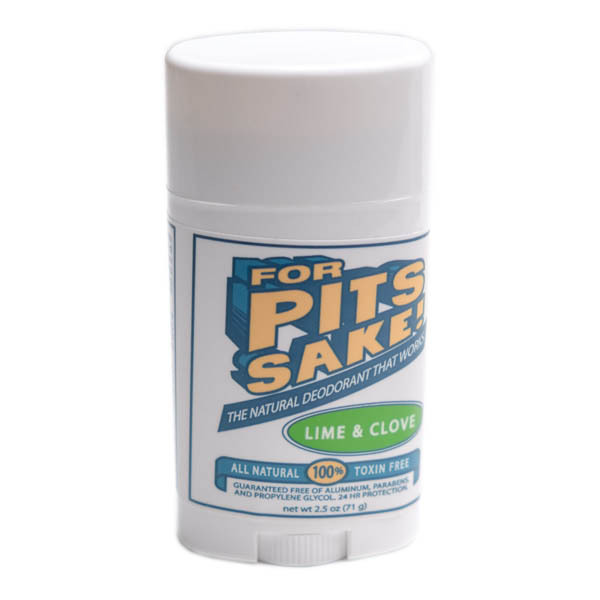 But, fortunately, you can get For Pit’s Sake in three other scents, including unscented. We’d suggest giving one of those a try. Each stick runs about $9. Green Tidings All-Natural DeodorantAn ingredient list similar to our top pick, but organic (and a little pricier). The ingredient list is similar to Sam’s: Baking soda and coconut oil are at the top of the list, and shea butter is included as a moisturizer. Lavender = LadiesAfter scrutinizing 155 deodorants, it became very obvious that lavender tends to be the go-to scent for natural deodorants marketed toward women. Other common “womanly” scents include jasmine, rose, and honeysuckle. 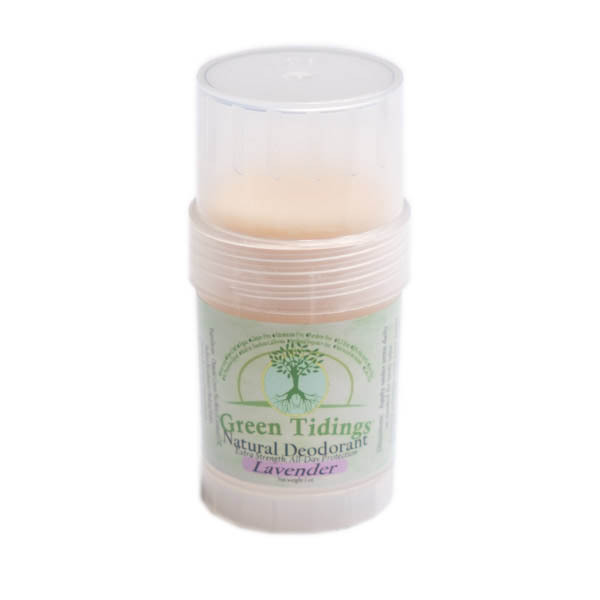 We tested Green Tidings’ lavender formula, although an unscented option is also available. Once again, our testers thought the scent was fairly unisex, with a very mild herbal aroma that omits the citrus notes of Sam’s. While the smell didn’t last long, neither was it replaced by body odor. When we checked in at the two-hour mark, our pits basically smelled like nothing. Green Tidings did feel a little gritty going on. One tester actually liked this, saying the grit made it so she could “really feel it in my pits” and know the product had applied. And unlike certified organic finalists from North Coast Organics and Bubble and Bee, Green Tidings comes in a circular stick and left no goopy clumps on our skin or hanging off the tube. When we tried our T-shirt test, Green Tidings also left way less residue than North Coast Organics Death by Lavender and Bubble and Bee Lemon & Clove Pit Putty Organic Deodorant Stick. The photos speak for themselves. Fatco Stank StopHas all three of our top odor-blockers, but is messy to apply. Also available in amen’s scent. Our testers generally preferred stick application, partly because it felt familiar — it’s essentially the same as rolling on a traditional antiperspirant. More importantly, creams were goopier, and most of our testers didn’t like having to wipe off their fingers after every application. 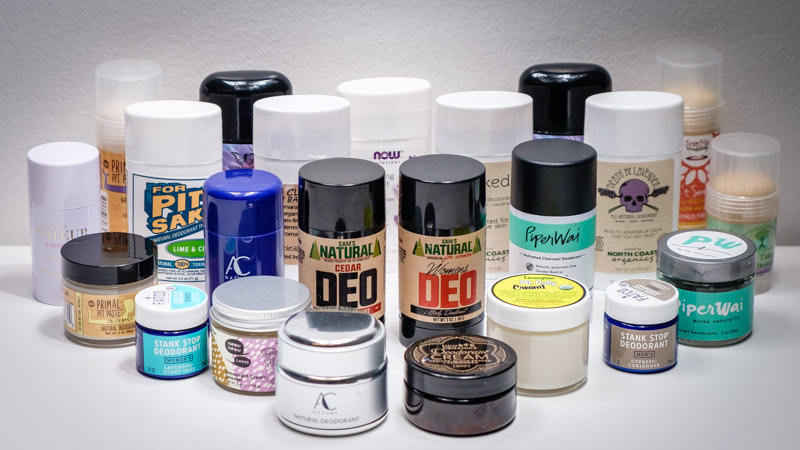 But among the seven cream natural deodorant brands we tested, Fatco Stank Stop stood out. Its formula is one of only two among our finalists to combine all three of our preferred odor-fighting ingredients: baking soda, coconut oil, and zinc oxide. 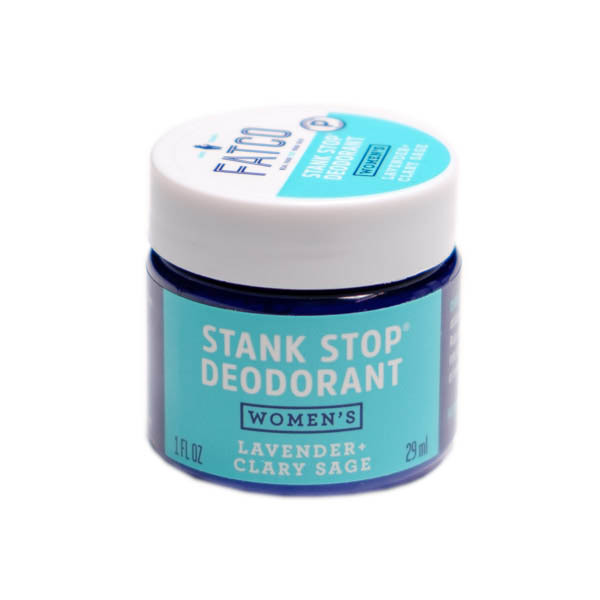 Fatco Stank Stop Deodorant comes in two scents: a Men’s Cypress + Coriander and aWomen’s Lavender + Clary Sage. As with other gender-specific deodorants, the ingredients differed only by the scent of the essential oil. We really liked both and suggest Cypress + Coriander for something a bit more woodsy, and Lavender + Clary Sage if you want a gentle aroma reminiscent of a spa treatment. Some of our testers thought dipping their fingers into goop, rubbing it onto their armpits, and then washing their fingers was just too messy, and Fatco’s small jars forced some of us to dip our fingers in several times to get enough product, which seemed impractical for anyone with big hands. One tester noted that the scent also lingered on his fingers even after washing. Agent Natuer & Shiva Rose Holi Rose DeodorantA very floral, feminine scent that leaves little residue. The company behind this product has a manifesto to “bring beauty and luminosity to women in a way that is nourishing and nurturing,” aka synthetic-, GMO-, and pesticide-free (although the deodorant does contain castor oil, which is on Whole Foods’ list of ingredients to avoid). We’d suggest trying Holi Rose if you’re looking for a high-end option. At $25, it was our most expensive finalist — but it also tied with For Pit’s Sake as a top performer in our fabric residue test. If you’re dressing for a special occasion or have a wardrobe dominated by dark colors or expensive fabrics, it could be a worthwhile investment. The world of natural deodorants can be a tricky one — and “natural” means different things to different people. We’d suggest choosing a product that omits aluminum (if nothing else, you’ll avoid yellow stains), and steering clear of fragrance, simple alcohols, propanediol, and propylene glycol. Instead, look for products with coconut oil, baking soda, zinc oxide, or some combination of the three. And above all, be open to trying a few different options to see what works best with your body. What’s natural deodarant are you currently using? Share with us below.